This three-novel boxed set follows the adventures of Ciardis Weathervane, a girl with no future, and Sebastian Algardis, the prince heir she loves.Ciardis and Sebastian were never meant to break the chains binding his powers or upend the imperial courts, now they’re ready to shatter an empire. Sworn To Raise 17-year-old Ciardis had grown up in poverty. Now chosen for a position at court,she travels across the empire to begin a new life. To survive, she’ll need to master intrigue, befriend a crown prince, and learn to control magical abilities she never knew existed. Sworn To Transfer Just when Ciardis becomes a companion trainee and saved the prince heir’s tenuous claim to the throne, humans begin to die in gruesome deaths.With enemies closing in ranks, Ciardis can’t afford to have her loyalty to court and crown called into question. A set of free fantasy books for lovers of spellbinding romantic adventure and wonderfully crafted worlds. Scroll up and download! 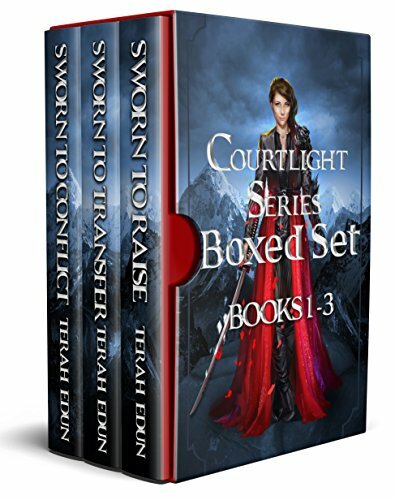 This is the Kindle version of Courtlight Series Boxed Set (Books 1, 2, 3) that you can also download and read on your computer and mobile phone. Kindle books are DRM protected and therefore, unlike ebooks that are in PDF or ePUB format, you cannot read this ebook without the official Kindle apps.